The strength of the concrete is closely related to the heating during curing (heat of hydration). For smaller constructions, the phenomenon is negligible, but very significant in mass concrete, e.g. for dam projects, or when the ambient tempreature is very high. The heat of hydration warms up the concrete by up to 25 °C and causes the concrete to expand. After curing, the concrete cools down and the volume decreases, which creates tensions that lead to cracks in the concrete. 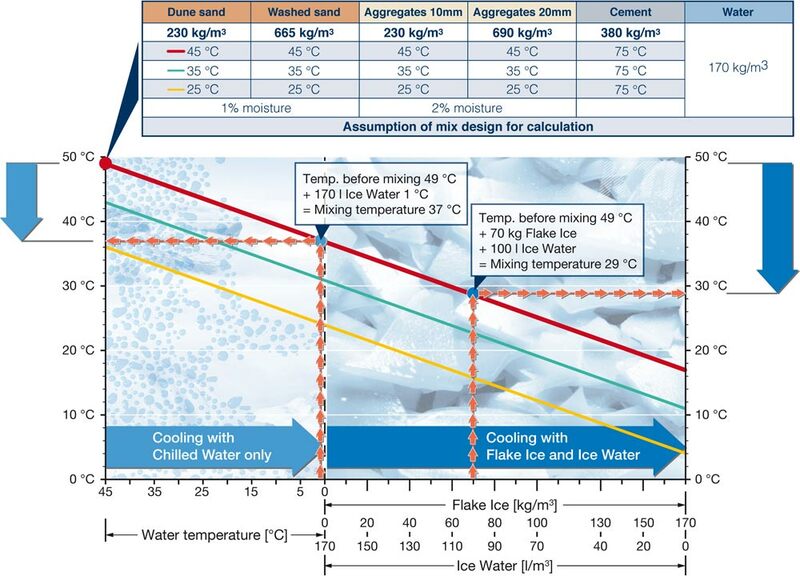 Therefore, the mixing temperature must be lowered, so that a maximum temperature as specified by the planners is not exceeded during the curing process. The required concrete pouring temperatures vary from site to site and country (from +7 °C to +30 °C maximum), hence there is always the need for a cooling system. Since investments and operating costs for a concrete cooling system can be high, it is important for KTI’s clients always to install an optimized system according to their needs.